For the Vincent van Gogh painting, see At Eternity's Gate. At Eternity's Gate is a 2018 biographical drama film about the final years of painter Vincent van Gogh's life. The film dramatizes the controversial theory put forward by Van Gogh biographers Steven Naifeh and Gregory White Smith, in which they speculate that van Gogh's death was caused by mischief rather than it being a suicide. The film is directed and co-edited by Julian Schnabel, from a screenplay by Schnabel, Jean-Claude Carrière and Louise Kugelberg. It stars Willem Dafoe as van Gogh, Rupert Friend, Oscar Isaac, Mads Mikkelsen, Mathieu Amalric, Emmanuelle Seigner and Niels Arestrup. Principal photography took place in late 2017 over 38 days at various locations across France where Van Gogh resided during his final years. At Eternity's Gate held its world premiere at the 75th Venice International Film Festival on September 3, 2018. The film was theatrically released in the United States on November 16, 2018, by CBS Films, before streaming on Netflix in France on February 15, 2019. It is set to be released theatrically and through video-on-demand in the United Kingdom on March 29, 2019, by Curzon Artificial Eye. For his performance, Dafoe was nominated for the Academy Award for Best Actor and the Golden Globe Award for Best Actor – Motion Picture Drama, among others, and won the Volpi Cup for Best Actor at the 75th Venice International Film Festival. Vincent Van Gogh is on foot on a country road while on his way to Paris in 1888. He comes across a young woman herding her sheep after allowing them to graze. He is captivated by her and asks to briefly sketch her. She is surprised and asks why he should bother to draw her. Later, he continues on to Paris where he meets Paul Gauguin and they share thoughts about aesthetics and the artistic life in the Paris art community. After visiting his brother Theo in Paris, Vincent continues on foot to the South of France in Arles. Vincent seems to nearly always be in a state of artistic and emotional exhaustion. He is on occasion stopped in his steps by his aesthetic responses to the country landscapes around Arles which often results in his deploying his canvas and palette to render such landscapes either in oil or in a large artist's sketch pad. As he arrives in Arles itself he finds a vacant room in a local yellow house for himself. Vincent begins to artistically contemplate the fleeting nature of many forms of still life. He thinks about paintings dealing with seasonal flowers, and thinks of making a defense of the artistic process which renders a permanent and eternal quality to the representation of flowers on the canvas which do not wilt and wither with time. For a while, Vincent's preferred medium becomes an empty large sketchbook about 11" by 14" in size given to him by a local woman and which he begins to fill with renderings of local landscapes done mostly in pen and ink. Vincent continues to ponder various philosophical and existential questions such as his desire "not to see a landscape but only the eternity behind it", and that "there cannot be such a thing as nature without there also being a meaning to nature." Vincent wishes to devote increasing amounts of time to rendering the landscapes which surround him in Arles. In his personal life while in Arles, Vincent creates ill feelings with students he encounters on a school field project where he happens to be painting and the students begin to mock him and the canvas he is working on at that time. He causes bad impressions upon the school teachers with their students who report his eccentric behavior to angry parents and angry town officials. His brother Theo is called to Arles from Paris, and somehow Theo quickly manages to get Gauguin to agree to visit his brother in Arles. Gauguin soon arrives in Arles. Vincent is at first exhilarated by the presence of his friend Gauguin though things quickly sour. When Gauguin quickly thereafter announces that he is to soon depart, the news is emotionally crushing to Vincent. He then cuts off a piece of his ear to show Gauguin his artistic allegiance to Gauguin, but Gauguin is already gone and departed from Arles. Vincent obscurely then turns to give the piece of his cut ear to a local prostitute who is horrified by receiving the bloody artifact and reports Vincent to the authorities. Vincent is then sent to mental hospital in nearby Saint-Rémy-de-Provence for recovery. After some time in recovery, he is released by a sympathetic supervising pastor at the mental hospital and goes to Auvers-sur-Oise (near Paris) since the town authorities in Arles will deny him permission to return to Arles. In the last months of his life, Vincent returns to his habit of drawing and painting local scenes and landscapes, now in Auvers. While painting one day in the courtyard of a deserted estate, two teenagers with their hunting gear including a working hunting rifle and pistol see Vincent and begin playing at cowboys-and-Indians to distract Vincent. During the horsing around disrupting Vincent's painting a spurious shot goes off. Vincent is hit by the bullet and the boys beg him not to tell anyone about their mischief. The boys then throw their rifle and pistol into a local river while Vincent goes the other way back to his room in Auvers. When he returns with his injury, medical help is called for and the local police make a report. Vincent tells them nothing about the boys and states the wound is self-inflicted. His brother Theo is called for from Paris but does not arrive in time. Upon arrival in Auvers, Theo finds his brother to have already died from the bullet wound he received less than thirty hours ago while he was painting his last landscape in the suburbs of Auvers. At the age of thirty-eight Vincent had finally passed through eternity's gate. Amira Casar portrayed the wife of Van Gogh's brother, Theo, who would translate the letters between Vincent and Theo after the death of Vincent. In May 2017, Schnabel announced that he would direct a film about the painter Vincent van Gogh, with Willem Dafoe cast in the role. For the film, Schnabel adapts Naifeh and Smith's theory that Van Gogh died through the mischief of others rather than by suicide as the premise for the screenplay of the film. The film is dedicated to the Tunisian fashion designer Azzedine Alaïa. This is a film about painting and a painter and their relationship to infinity. It is told by a painter. It contains what I felt were essential moments in his life; this is not the official history – it's my version. One that I hope could make you closer to him. In 2011, authors Steven Naifeh and Gregory White Smith published a biography, Van Gogh: The Life, in which they challenged the conventional account of the artist's death. In the book, Naifeh and Smith argue that it was unlikely for van Gogh to have killed himself, noting the upbeat disposition of the paintings he created immediately preceding his death; furthermore, in private correspondence, van Gogh described suicide as sinful and immoral. The authors also question how van Gogh could have traveled the mile-long (about 2 km) distance between the wheat field and the inn after sustaining the fatal stomach wound, how van Gogh could have obtained a gun despite his well-known mental health problems, and why van Gogh's painting gear was never found by the police. Mads Mikkelsen portrayed the sympathethic pastor who arranged for the release of Van Gogh from recovery at hospital to continue painting in Auvers. Naifeh and Smith developed an alternative hypothesis in which van Gogh did not commit suicide, but rather was a possible victim of accidental manslaughter or foul play. Naifeh and Smith point out that the bullet entered van Gogh's abdomen at an oblique angle, not straight as might be expected from a suicide. They claim that van Gogh was acquainted with the boys who may have shot him, one of whom was in the habit of wearing a cowboy suit, and had gone drinking with them. Naifeh said: "So you have a couple of teenagers who have a malfunctioning gun, you have a boy who likes to play cowboy, you have three people probably all of whom had too much to drink." Naifeh concluded that "accidental homicide" was "far more likely". The authors contend that art historian John Rewald visited Auvers in the 1930s, and recorded the version of events that is widely believed. The authors postulate that after he was fatally wounded, van Gogh welcomed death and believed the boys had done him a favour, hence his widely quoted deathbed remark: "Do not accuse anyone... it is I who wanted to kill myself." Schnabel adapts Naifeh and Smith's theory for the screenplay of the film. According to Éntertainment Weekly, "Dafoe immersed himself in the artist's life, learning to paint, reading his letters, and ultimately shooting on location in artistically recognizable landscapes". Dafoe added, "You're not illustrating who you think van Gogh is; you're communing (with) his memory and what he's left behind... It all comes together in a swirl--a swirl of color, a swirl of light. It's not naturalistic representation. But it captures the spirit... [Van Gogh] thought art was a language; art was a way of seeing; art was a way of waking up." In an article for 'W' magazine, Dafoe further stated, "I painted in a movie called To Live and Die in L.A., but it wasn't about painting--it was more about counterfeiting and killing people. In playing Vincent van Gogh, painting was the key to the character. I had to know what I was doing. The director, Julian Schnabel, would say, 'Hold the brush like a sword' and 'There's no such thing as a bad mark.' I began to think that painting is about making an accumulation of marks. Acting is the same: You create a character scene by scene. It's a series of marks that start a rhythm, and that rhythm sends you where you need to go." It was noted that Dafoe was 62 at the time of filming, 25 years older than Van Gogh when he died. The Yellow House, Arles, 1888. The room and house where Van Gogh resided in Arles has since been demolished and converted into a local park. Van Gogh Museum, Amsterdam. 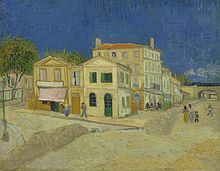 The film was shot over 38 days beginning in September 2017 on location in Arles, Bouches-du-Rhône and Auvers-sur-Oise, France, all locations where Van Gogh lived during his final years. The soundtrack for the film was composed by Tatiana Lisovskaya. The music is predominantly for solo piano in a minimalist classical tone with occasional accompaniment by solo instruments and string quartet. The soundtrack contains 16 tracks and was released in 2018. In May 2018, CBS Films acquired distribution rights to the film. It had its world premiere at the 75th Venice International Film Festival on September 3, 2018. It was also screened at the New York Film Festival on October 12, 2018. The film was released in the United States on November 16, 2018. It was released for streaming on Netflix in France, beginning on February 15, 2019. The film will be released simultaneously in theaters and on-demand in the United Kingdom on March 29, 2019, by Curzon Artificial Eye. At Eternity's Gate was released on Digital HD on January 29, 2019 and on Blu-ray and DVD on February 12. Special features included an audio commentary with Julian Schnabel and Louise Kugelberg and three featurettes. 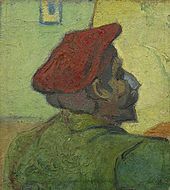 Paul Gauguin painted The Painter of Sunflowers: Portrait of Vincent van Gogh in 1888 in Arles. Currently at the Van Gogh Museum in Amsterdam. On review aggregator Rotten Tomatoes, the film holds an approval rating of 80% based on 166 reviews, with an average rating of 7.16/10. The website's critical consensus reads, "Led by mesmerizing work from Willem Dafoe in the central role, At Eternity's Gate intriguingly imagines Vincent Van Gogh's troubled final days." Metacritic gives the film a weighted average score of 76 out of 100, based on 34 critics, indicating "generally favorable reviews". Manohla Dargis writing for The New York Times gave the film a strong review stating that the film is, "a vivid, intensely affecting portrait of Vincent van Gogh toward the end of his life, the artist walks and walks. Head bowed, he looks like a man on a mission, though at other times he seems more like a man at prayer." Adam Graham writing for the Detroit Times found the performance by Dafoe to be notable stating, "Dafoe adds another masterful performance to his resume; his work here is as deep and as piercing as his performance in The Last Temptation of Christ more than 30 years ago." 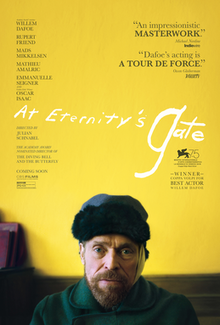 ^ "At Eternity's Gate". Venice International Film Festival 2018. Venice Biennale. Retrieved July 27, 2018. ^ "At Eternity's Gate (2018)". The Numbers. Retrieved April 14, 2019. ^ Hirschberg, Lynn. "'At Eternity's Gate': Julian Schnabel Explains His Vincent Van Gogh Movie". W Magazine. Retrieved January 4, 2019. ^ a b Thompson, Anne (May 23, 2017). "Willem Dafoe as Vincent Van Gogh in 'At Eternity's Gate': Julian Schnabel Gives Us An Exclusive First Look". IndieWire. Penske Business Media. Retrieved July 29, 2018. ^ Roxborough, Scott (November 2, 2017). "AFM: SPK Pictures to Finance New Films From Julian Schnabel, Harmony Korine (Exclusive)". The Hollywood Reporter. Prometheus Global Media. Retrieved July 29, 2018. ^ Lodderhose, Diana (May 20, 2017). "Willem Dafoe To Play Vincent Van Gogh In Julian Schnabel's 'At Eternity's Gate' – Cannes". Deadline Hollywood. Penske Business Media. Retrieved July 29, 2018. ^ Boehm, Mike (October 13, 2011). New book, '60 Minutes' question if Van Gogh really killed himself. Los Angeles Times, October 13, 2011. Retrieved from http://latimesblogs.latimes.com/culturemonster/2011/10/vincent-van-gogh-60-minutes.html. ^ a b Gompertz, Will (October 17, 2011). "Van Gogh did not kill himself, authors claim". BBC News. Retrieved October 17, 2011. ^ Maureen Lee Lenker. Éntertainment Weekly Feb1/8, 2019. Page 56. ^ 'W' magazine. January 2019. ^ "Ate Eternity's Gate". Tatiana Lisovskaya. Release Date: November 16, 2018. Label: Filmtrax Ltd.,Total Length: 1:01:32. ^ Lang, Brent (May 14, 2018). "Julian Schnabel's Van Gogh Drama 'At Eternity's Gate' Sells to CBS Films". Variety. Penske Business Media. Retrieved July 29, 2018. ^ Anderson, Ariston (July 25, 2018). "Venice Fest Lineup Includes Coens, Luca Guadagnino and Alfonso Cuaron". The Hollywood Reporter. Prometheus Global Media. Retrieved July 25, 2018. ^ Vivarelli, Nick (July 25, 2018). "Venice Film Festival Lineup: Heavy on Award Hopefuls, Netflix and Star Power". Variety. Penske Business Media. Retrieved July 25, 2018. ^ Fleming, Mike Jr. (August 1, 2018). "New York Film Fest Closer: Julian Schnabel's'At Eternity's Gate' With Willem Dafoe As Van Gogh". Deadline Hollywood. Penske Business Media. Retrieved August 1, 2018. ^ D'Alessandro, Anthony (August 29, 2018). "Netflix Eyes Awards-Season Theatrical Release Dates For 'Buster Scruggs', '22 July' & 'Roma'". Deadline Hollywood. Penske Business Media. Retrieved August 29, 2018. ^ Cauhapé, Véronique (February 15, 2019). "« At Eternity's Gate » sur Netflix : Van Gogh, ou la fièvre de peindre" (in French). Le Monde. Retrieved February 19, 2019. ^ "At Eternity's Gate". Curzon Artificial Eye. Retrieved February 19, 2019. ^ Latchem, John (January 9, 2019). "'At Eternity's Gate' Due Digitally Jan. 29, on Disc Feb. 12 – Media Play News". Media Play News. Retrieved February 19, 2019. ^ Evangelista, Chris (February 5, 2019). "New Blu-ray Releases: 'The Girl in the Spider's Web', 'Overlord', 'At Eternity's Gate', 'Valentine', 'Cobra'". /Film. Retrieved February 19, 2019. ^ "At Eternity's Gate (2018)". Rotten Tomatoes. Fandango Media. Retrieved April 14, 2019. ^ "At Eternity's Gate Reviews". Metacritic. CBS Interactive. Retrieved April 14, 2019. ^ "Venice Film Festival: Alfonso Cuaron's 'Roma' Wins Golden Lion (Complete Winners List)". Variety. Retrieved September 9, 2018. ^ "VENEZIA 75 - Il Premio Fondazione Mimmo Rotella a a Willem Dafoe e Julian Schnabel - CinemaItaliano.info". www.cinemaitaliano.info. Retrieved September 4, 2018. ^ "Collateral Awards of the 75th Venice Film Festival". labiennale.org. Retrieved September 9, 2018. ^ "2018 Nominees". International Press Academy. November 29, 2018. Archived from the original on November 29, 2018. Retrieved November 29, 2018. This page was last edited on 14 April 2019, at 17:48 (UTC).